When people set out to buy a milk frother, they are really looking for something to have in their kitchen that will concoct the delicious additive to their coffee which makes it as good as the kind that they can acquire in their favorite neighborhood coffee shop. 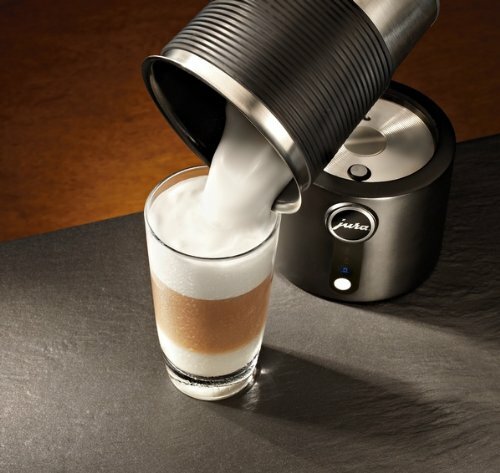 We were eager to check the Jura milk frother, because we heard that it is one of the best ways to give you a hot and creamy coffee, or luscious latte with not much effort and not much mess. 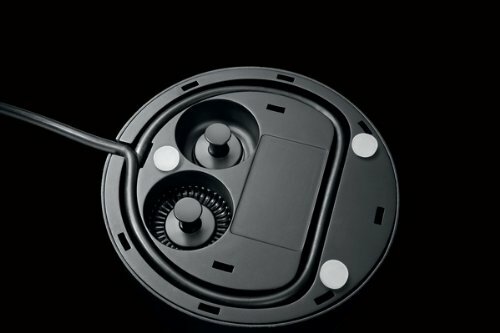 Here are some of the features of the Jura Milk Frother, to give you a sneak peek at what you can expect when you purchase this cool little culinary whisking work of wonder. The Jura milk frother is most definitely one of the most high-rated frothers in the industry, and right when we got it home, we noticed that this is some very thick and creamy froth: our first run was a froth that we wanted to top cappuccinos with. The capacity of what you can do struck us as pretty large immediately: 8-12 oz is a totally different ballpark then some others that are single-cup makers. Having different temperature settings is another very big plus: we used the warm one a lot, but hot is still very optimal for the types of drinks you’ll want when the days are short, and the snow piles high outside. Since the pitcher is made of stainless steel, it detaches in a snap and you can take it right to the sink for easily rinsing it off. As we poured skim milk in and got ready to really take it for multiple test drives, the automation of the Jura milk frother was pretty impressive: we let it rip for quite a while to make sure that the auto-shut off really did it’s job, and it worked well 8 times in a row. As you are looking at the outside of the pitcher getting ready to make your delicious drink, there are handy marks right outside of it that indicate the measurements of what you are pouring. One of the other things we noticed right away about the Jura milk frother was the noise factor: there isn’t much of one to speak of. As we were waiting for our froth, it seemed like this was not the type of machine that you would add to your coffee-loving home’s regimen and have it wake up everyone who was not ready for a shot of their own yet. Since it comes with three disks, this is very handy: you don’t feel as if you are getting a product that needs you to re-order important items right from the get-go. What surprised us is that many of the other frothers we have used this month did the job in about one minute, and this machine takes about double that. However, no matter how big of a rush you are in, two minutes is still a short wait for what this machine delivers. The quality of the froth is quite a bit different then say what the handheld Idea model produces: the outcome from this one is very soft, and with a high level of consistency. 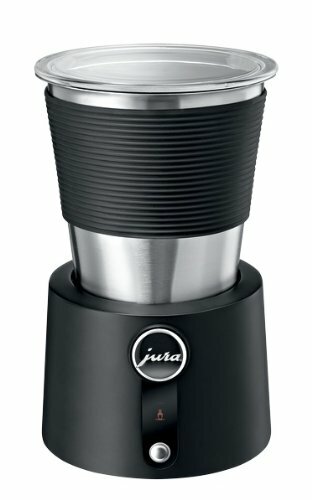 You can power the Jura milk frother with an AC converter and a car cigarette lighter, and so in theory you really COULD bring it on camping trips if you so desired. We would have to also give it very high ratings based upon the “hot” temperature setting: It is truly steaming froth! Check out our post on the best milk frother reviews. We aren’t sure that we would go as far as to say that what you can get from this machine is “Better than Starbucks or your local coffee shop”, but depending on your additive ingredients, it very well could be. You can usually find one of these on Amazon for under $100, and it is quite possibly one of the best all-around household frothing products out there. You can check the Capresso frothPRO Milk Frother Review over here!